Would a “National Checkoff” Fit Organic? Many people dream of the simple life – growing their own food, maybe even making a living as a farmer – but bills need to be paid and it’s a long commute from the peaceable kingdom to the cubicle. Can you make a living while still living in or near a city? The answer is…maybe. Some of it will depend on whether you have any land at all and a lot of it will depend on what crop you choose to grow….and, no, I wouldn’t recommend planting the illegal stuff. Short-term gains often result in the former farmer being a current ‘guest of the state’. A dairy farm in Manhattan isn’t going to work, however some crops do bring more profit per square foot. Bees, mushrooms, herbs and berries all take relatively little space and potentially earn large profits as do either earth or hydroponically grown lettuce and other quick-growing, high value per square foot items. 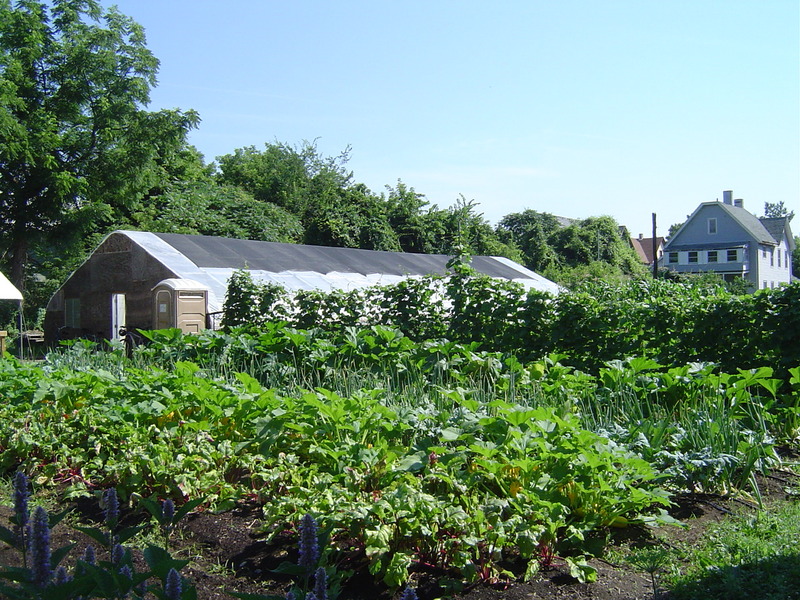 A check on the Internet and a few phone calls confirms that where property values and incomes have dropped, community gardens, farms, and the necessary classes to educate potential farmers have grown. Miner may be correct that Ithaca doesn’t have an in-the-city urban farm movement, but it does have several farm operations within the city limits. For example, Blue Oyster Cultivation, a mushroom farm, is located within just a few miles of downtown. Ed Harwood, a Cornell professor, farmer, and co-founder of AeroFarms, which uses innovative technology to sustainably grow greens year round, resides in the Ithaca community as well. Harwood, a dedicated advocate for urban farming solutions, developed the AGL-21 growing system, a 30 X 60 inch box that produces baby lettuce plants in 18 days using aeroponics technology, LED lights and a water/fertilizer mixture pumped through plastic tubes that might allow a city dweller to farm in his basement. Other cities are becoming hubs for urban farming development also. Sean Cummings at the University of Binghamton, just south of Ithaca, has been running an urban farm for several years on a half acre of ground, selling about a ton of vegetables and fruits each year at the Binghamton Farmer’s Market. 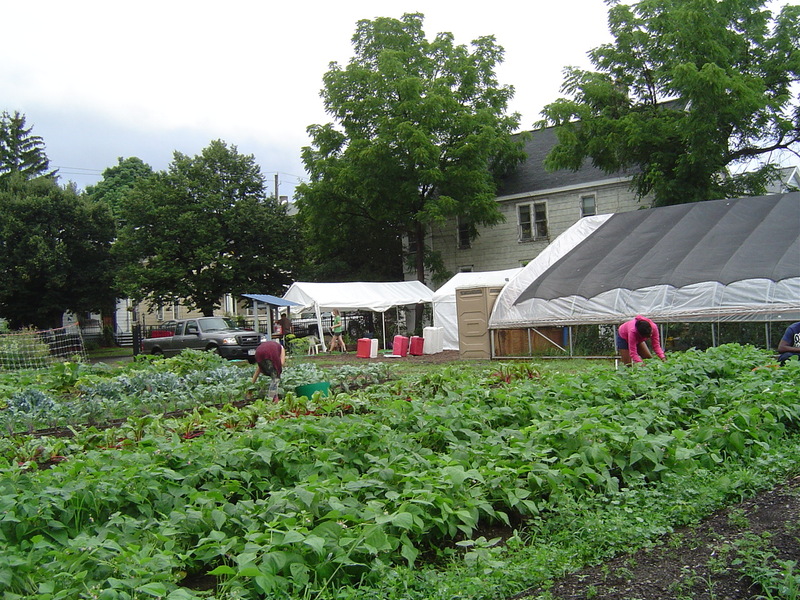 The Binghamton Urban Farm is run by Volunteer Improving Neighborhood Environments (VINES), a volunteer organization that works to educate local youth and provide fresh, healthy vegetables to low income residents. In addition, VINES provides jobs for teenagers through the City of Binghamton Green Jobs Grant, which comes from Community Development Block Grant Funds. They also benefit from a partnership with Broome County Gang Prevention. In addition to learning how to grow vegetables, youth learn basic money management skills and leave the program with a résumé that will help them land future jobs. VINES also started Fair Share, a CSA that is designed to be affordable to low income residents, thus increasing nutrition and food security. City farmers have the same problems that rural farmers have – weather and insects for instance – but they can also encounter problems only occasionally experienced by farmers in less populated areas, such as occasional theft of produce or vandalism, some of which can be alleviated by fencing or planting a ‘trap crop’, peas for instance, on the perimeter of the property. Those who garden using organic principals also worry about chemicals used by neighboring landowners drifting onto their property. 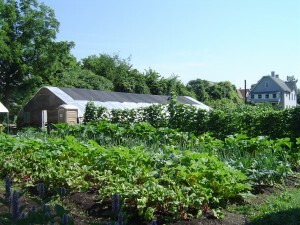 One potential problem that is not unique to the city gardener, many of whom use borrowed property for their farms, is the worry that their garden space will eventually increase in value so much so that it will be sold for a building lot. Just as some farmers near small towns and cities complain about the farmland wasted on five acre housing tracts, it’s tough to work the soil and finally get it in top shape for production only to have it become too valuable and taxes too high for crops. Urban farming is something that can be started on a small scale, one raised bed or hydroponic kit at a time tended after work, or, if you have a healthy bank account, by jumping in full time, purchasing a tiller and taking advantage of that spare half acre next to your house or down the block. Those who have done it advise that you do some research first, not only on gardening, but on potential customers. Talk to area businesses such as restaurants and local small stores or to people in your neighborhood or those who patronize your closest farmer’s market. You might be unpleasantly surprised at the quantities a restaurant will require to consider you a reliable source of salad greens but you might be pleased to find that you can start a neighborhood CSA and it could be that flowers, small fruits or herbs will prove more profitable in your area. Finally, grow what you’re most interested in eating, or come up with a way to create a ‘value added product’ such as dried herbs or jelly just in case you don’t sell all your produce, the food won’t be wasted. Pat Brhel is a community volunteer and freelance writer who lives in Caroline, N.Y. She can be reached at lsparrow@hotmail.com or 607-539-9928.